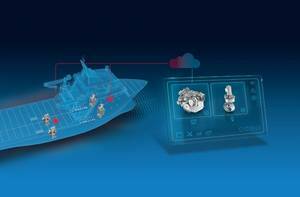 At the 15th Maritime Industry Exhibition in early May in Gorinchem, the Netherlands, ZF Marine Krimpen will debut its Condition Monitoring System. ZF's system is designed to help shipyards, shipping companies and fleet operators maintain the safety and efficiency of their ships. It is equipped with various sensors and an intelligent electronic evaluation unit. The system measures vibrations which indicate the condition of the bearings and gears in the thruster's upper and lower gearbox. The measurement results help the operators identify early on which components need to be replaced or maintained, meaning repairs can be planned in advance. It also is designed to help extend the service life of the monitored systems and components.